Our Kitchen Makeover – No More Maple! You are here: Home / My Projects / Kitchen Remodel and Design / Our Kitchen Makeover – No More Maple! When we bought our home 2 years ago I knew that the kitchen was not long for this world. Sure, other people thought it was just fine – I mean the cabinets were solid wood, what can be bad about that, right? That’s right, just because it’s wood doesn’t mean it’s good. Are they good because they are solid? Sure, and they’ll still BE solid…under 3 coats of glorious white PAINT! 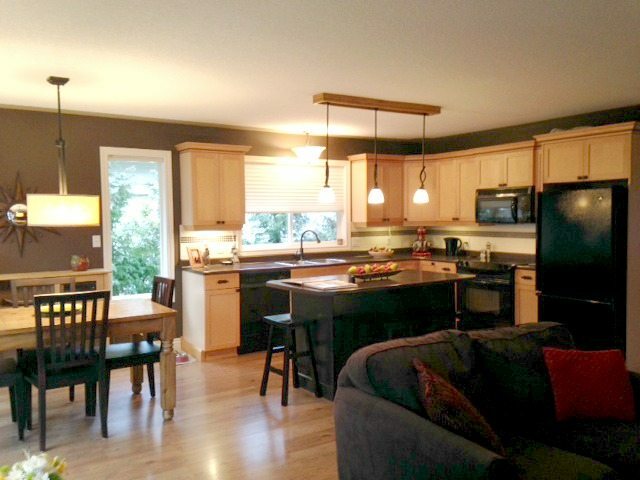 This was our kitchen before…obviously not bad at all – just not our style and although you can’t see it in the photos, the side gables on the cabinets (which were NOT solid wood) had faded to a soft pinkish colour and the doors around the sink area were needing some serious KLC. Wanna know what we did? Oh, I say ‘we’ like Tim was involved – you know I make all of the big decisions around here (wink wink). 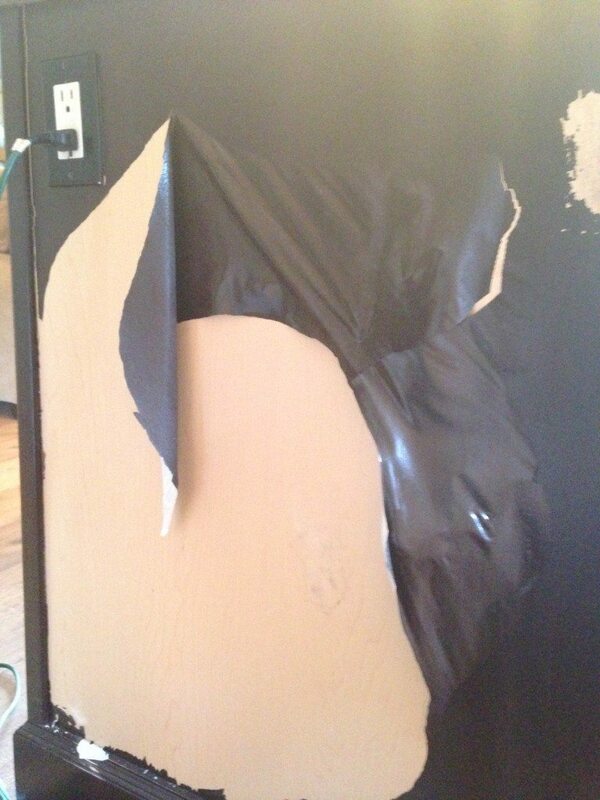 YES, this is what happens when you don’t prep your cabinets properly – THE PAINT WON’T STICK and will peel off! I will also enforce the fact that it was not me, nor anyone I know who did this…SACRILEGE! And with some prep work and the right type of paint, this is what the cabinets SHOULD have looked like. Delea of Details Painting did the prep and painting and did an AMAZING job. I painted the cabinets in our last home, but they were oak and oak is much more (ahem) forgiving for less than epic painters. I’m a pretty good painter, but I would NEVER tackle smooth maple cabinets on my own! Delea took the drawers/doors away and sprayed them smooth as a baby’s bum! The pieces that couldn’t be removed were hand-painted and you can hardly tell the difference between her brush-work and the sprayed stuff – friggin’ genius! Simple and solid was what I was going for. I didn’t want too much decorative detail as the wood itself with a light gray wash would do the decorative work for me! Again, choosing a laminate countertop instead of quartz saved THOUSANDS of dollars on ye ole budget, which left me some room to do other fun things – like buy wine! This countertop mimics the look of soapstone and to be honest with you, the quartz island countertop is more high-maintenance than ME! I see every speck on, even after it’s wiped. The formica/laminate? I can not wipe it for days (true story) and not see a thing. In fact, I didn’t notice some of the junk on the counter until I took photos and realized there were crumbs…oops. I LOVE this backsplash. It was installed by my fave local tile guy, Brett Edwards (BE Tile) – he did a great job. Because the cabinets weren’t entirely level, he had to hand-cut each and every perimeter tile – and he did it with a smile (and probably an inside voice that was full of 4 letter words). Our main floor is an open layout living room, dining room and kitchen, so one thing ALWAYS relates to another. This is another reason (other than my OCD) why our dining room AND living room both received makeovers in the last 6 months – knowing that the changes in the kitchen would be a HUGE shift for the entire space. Now it feels like a breath of fresh air! And while our lighting situation is in a bit of transition (really, everything in our home is), there was nothing I could do about the pendants over the island. The original builder only put 1 junction in, so while in the ideal world I would have 2 pendants hanging independently of each other WITHOUT a huge honkin’ track tying them together – it ain’t happenin’ this go round. Remember my blog post about ‘how to add light to a dark room?’ While this room is south facing and had tons of light, it had about as much energy as me at 7 am – nadda. Reflective surfaces move the light around a space, adding energy and life! 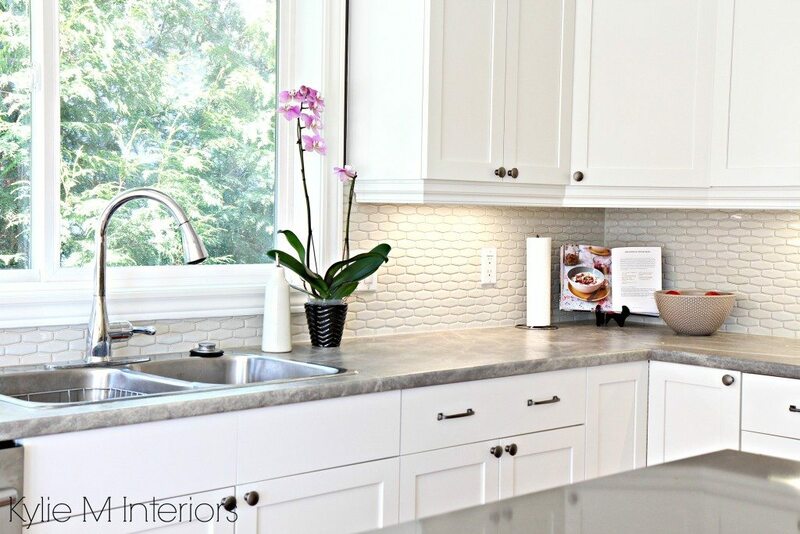 This backsplash is not just trendy (you know how I feel about trends), it is also RIGHT up my alley as I find the hexagon to be one of the more timeless patterns. Not too soft, not too edgy – juuuust right. Now you might think that I drank myself a few bottles of wine, snapped my fingers and got all of this done. Nope. Like a lot of my clients, this kind of stuff takes some serious coin and I had to BUDGET! We did the countertops about a year ago, the backsplash and appliances 6 months ago, and the painting and general furnishings 1 month ago. I don’t mind taking my time if it means I’m making smart choices and the end product is going to SUPER fabulous AND affordable. So there it is – she’s done…well until next month anyway (wink wink). UPDATE: Want to know how well they held up? Need help with your own home? Check out my affordable Online Consulting Services – I’d love to help! I’m a recent fan of yours so I didn’t quite understand the “how you feel about trends” remark but I’m going to say – I love the after photo! It looks so trendy. Trendy but classic and timeless! Love that you live in Nanaimo – I’m in Victoria. Hey island girl! So, about the ‘how I feel about trends’, part – if you ever see a line/word in purple and then underlined, if you click on it, it will take you to another article that I’ve done. If it’s underlined and NOT purple, it will take you to a different site (usually product related). SO, if you are see something underlined in purple, feel free to check it out! And thank you, it is so much more bright and beautiful and I’m LOVIN’ it! I love your kitchen! Though I do prefer wood cabinets myself, this is so bright and fresh that it’s almost made me a convert. 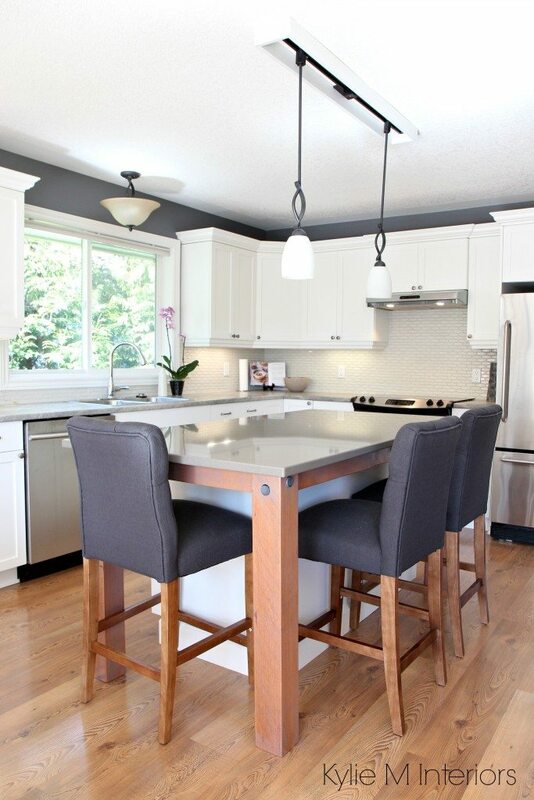 My two favourite parts are the backsplash – fun and interesting, and the wood legs that were added to the island. Another great job! Thank you Janet, my island friend! Yes, you know there are A LOT of wood cabinets that I like and if they’d done wood gables on these ones (and they were in good shape) there is a chance I would have kept them in their original condition. HOWEVER, i’m really glad I bit the bullet and got it done! I was SO sure you wouldn’t be able to convert me from loving the original warm wood of the cabinets but when I look at the whole space finished I have to say that room just came to life. I love the look, the energy and the flow. Another great job! Beautiful makeover! Can I ask what color white you used for the island and cabinets? So perfect in your space! Thank you! And of course you can ask, but I won’t answer. Just joking 😉 It’s Benjamin Moore Cloud White. I did consider Simply White but wanted things just a stitch softer looking and I’m SO glad I did – they are just lovely to look at in real-life! Your makeover is absolutely beautiful! I love it all! Thank you Deedra! How are you doing with your living room????? Kylie, been following you for a few years, and you will be hearing from me soon re: master bedroom makeover. Your white kitchen is beautiful. I am of the opinion white cabinets never go out of style, like oak, cherry, dark wood. I have a very large kitchen 20 X 26 and all white cabinets. 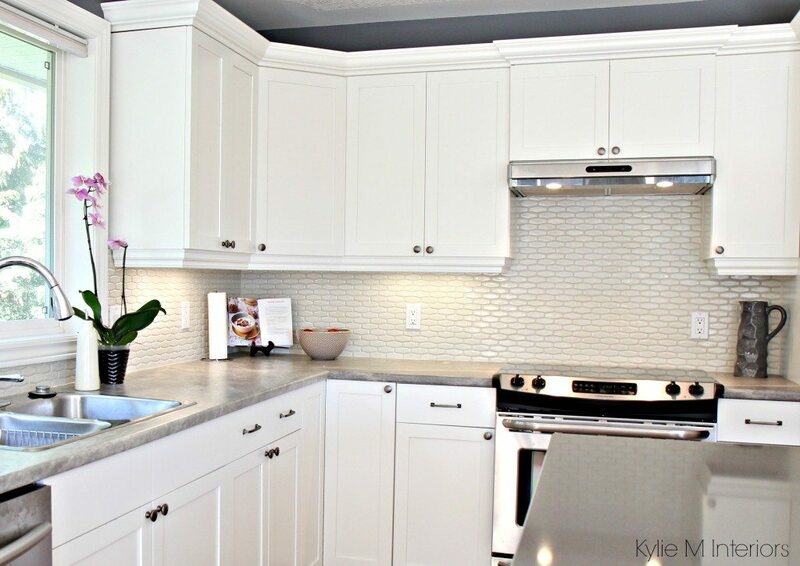 Love the backsplash tile, again all white, who can argue with that? Great job. Thank you Peta! I think you’re right, wood cabinets can come and go, but white stays pretty darned timeless. And I’d LOVE to hear about your master bedroom makeover, just holler when you’re ready! I love the white. I think the old maple cabinets were nice but the flooring was already wood and black appliances were just too much darkness. I think if you had a nice bright counter and bright flooring it would have been fine with a stainless update on the appliances. I think your white cabinets have made the space so much brighter. Nice update! I need cabinets. I have white but they are thermofoil and cracking/falling apart. I don’t recommend that type to anyone. I like the style of your cabinets. Is that Shaker style? DO you recommend a manufacturer or place to purchase cabinets? Would you go with a Home Depot/Lowes type place or to a kitchen cabinet centre? Hi Sharon, yes thermofoil can be a problem. They generally have a 10 year warranty and once 10 years has past you better cross your fingers! Now I have come across clients how have peeled that skin off and painted them, but man, that’s a lot of work. Yes, the style we have is Shaker Style, pretty darned timeless. When it comes to things like kitchens I shop around. Quotes are free (or should be) so I would just get 4-5 quotes and decide on the one I like the best – whether it’s H.Depot or a smaller local business! Cabinet prices vary SO much and the little add-ons add up REALLY fast. Those soft close drawers (which are so lovely) – add up. The solid wood boxes – yup – more moula. When I’m working with clients and we’re doing new kitchens here’s a few of the things I recommend. 1. If you are doing white cabinets you don’t have to do solid wood boxes – have you ever seen a kitchen box fall apart? Rarely. While I would prefer solid wood doors, I’m not fussy on the boxes. However, if they are wood stain, then I would probably want wood boxes and gable ends – unless the melamine match is PERFECT (but I’d STILL want solid wood gables so the ends don’t fade like mine did). 3. Pay attention to the gimmicks, like fancy lazy susans and special spice drawers – these things add up FAST. 4. When you get a quote make sure it’s broken down into parts, so you know EXACTLY how much more you are paying for solid wood boxes/spice drawer/soft close/etc… this way you can look at the added cost and decide whether it’s worth it or not. There, my verbal diarrhea for the nite is done! I love that you replaced the microwave over the range with a hood. Where did you move the microwave to? DAMN you’re perceptive Stacey – nicely done! Actually we don’t use the microwave a lot. What I did, is I had an electrician come and put an outlet in one of my lower cupboards. I was able to clear off the top shelf and put the microwave on it with about 5″ on either side for ventilation. A lot of people do this and then take the doors off and get a ‘kit’ of sorts around it. Personally I just don’t want to see it, so when we use it I just keep the cupboard doors open and when we’re done I shut ’em! Thanks for asking and YES it made such a huge decorative difference in the space! Good idea w the microwave. When we moved to our present home, there was 1 cabinet w an outlet under it. Have no idea why, but I purchased a small microwave & put inside w hole for cord. Recently had cabinet removed. Kitchen looks 50% larger & had painter paint med. dark solid oak cabs. in white. My husband kept saying no. Once he saw them, he loved it. Our house will go on market in abt 6 weeks. Think I may do those cabs white too. Agree 100% about laminate, but will probably use quartz or marble in bathrooms. Loved your article! Hi Barbara, thank you so much for your comment! I do receive so many questions that sometimes it’s just darned nice to get some feedback and ‘personal experience’ stories! Hi Jada, a local island gal – how cool! I had Delea of Details Painting do them and she did a fab job. Comparable quotes were $5000-$6000, so while there are a few flaws here in there, it’s NOTHING I even bat an eye at. her cost was $1500 and it was SOOOOOOOO worth it. Seriously, give her a holler. She handpainted all of the stationary bits (as I didn’t want any spraying down in the house) and she took the doors/drawers away, caulked the seams and sprayed them – close up it’s just as beautiful and her hand-work is just fabulous. I’ve painted cabinets before but they were oak, because of the grain/texture, there’s a bit more forgiveness for error. 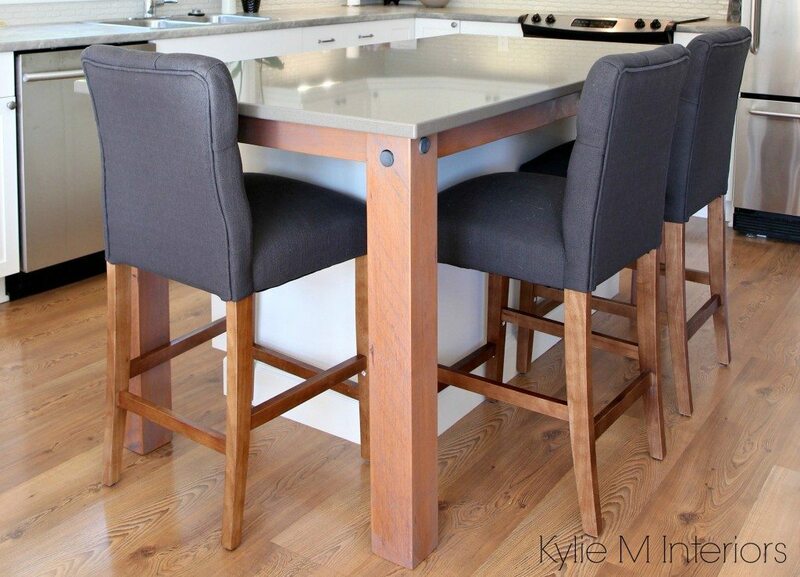 With the smooth finish of maple, anything beyond a very minor flaw can REALLY stand out! Looks beautiful, I agree with others, white is always timeless. It looks so updated and fresh, and I am very excited to learn about the laminate countertops you used. I had no idea! NOW, when do we get to see the updated home office??? My, my Kylie you have been a busy gal!!! Looks fabulous!! I wouldn’t miss maple cabinets for one second. Love the clean lines of your island legs. And of course I am liking the grey. Oh the endless possibilities of accessorizing a backdrop of grey!! It looks fantabulous!! I didn’t hate on your old kitchen by any means but the new look is like “yowzah” lol. Change is good and bringing in your own personal style oh-so-importante. I really love the backsplash. It’s cool and fresh looking. Love geometric shapes too. We just did our laundryroom over (it’s almost done–big smile here) and replaced my laminate countertop with a soft marble-look Quartz. I really love it. I literally keep gazing at it…can’t stop! I have a slight pattern to mine and cannot see specks of dust etc. I’m sure you’ll get used to yours soon–it looks amazing. Enjoy every detail of your new kitchen. Thanks for sharing with us. Your sense of humor puts a smile on my face every time. Thanks for that too. Well thank you Robin – I bet your laundry room is lovely – send some pics!!!! Kylie, you speak-a my language! Nobody can explain the nuances of colour like you do…This is my go-to place paint decisions, and I recommend it to all my friends! Thanks for all the time you put into answering questions. You are gracious and it’s so helpful for the rest of us! I like your fresh look with white cabinets. I wonder how long the painted cabinets last. My 12 year old maple cabinets have no sign of wear, and though I love white, I am afraid they would look a bit worn after 12 years. Does anyone know how long professionally painted cabinets continue to look stunning? Hi Ann, sorry for the delayed reply, but I did want to answer your question! And yes, painted cabinets will show wear quicker than wood cabinets. It is likely that the finish will be as hardy, but the problem is that it’s easier to see scratches/chips/etc… when you have a white surface with wood underneath. You can expect the same wear and tear as your maple cabinets, you will just NOTICE any scratches more on painted cabinets. I LOVE your new kitchen look and think it is still very warm and inviting while being fresh and energizing! Thank you Kimberly, it’s been about a year now and I still love it, which is amazing for me as I usually tire of things and crave change….so far so good! 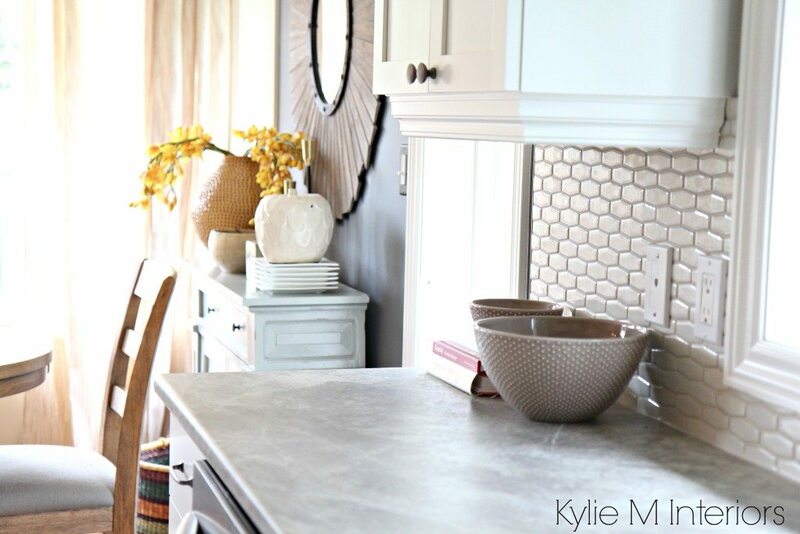 Hey Kylie, Nice work on your kitchen! Since your kitchen reno, have you had any issues with your mortise joints splitting? We are struggling with whether to get MDF or solid wood (painted maple) and we hear this can be an issue (from a lot of other designers). Hi Paula and Mark, thank you for asking! I hadn’t paid much attention them lately, so I just did little walk around. I have one joint that has split, but only one. The others look 100% okay – I see nothing even close to splitting. I was aware of this risk with maple, where the paint could split and crossed my fingers that I’d be okay – I was willing to take the risk as I was OVER the maple and didn’t want to buy new. We used Benjamin Moore Advance in the Pearl finish which I’ve been SUPER happy with for the finish/wipeability and who knows, maybe it’s a bit more elastomeric, which would account for some good flexibility, it could be worth looking into the brand of paint that they use. I had 1 painter tell me that there should be a thin line of clear, paintable caulking on the joints, so that they can withstand a bit more contracting/expanding, but he was referring more to the joins where the panel of the door meets the frame – not the mortise joints. I guess the thing is that it’s a risk – wood contracts and expands and even a small degree can cause a hairline crack. Weighing it off over the seamless look of MDF? It’s a tough call…if you are going solid wood, maple IS the way to go, but there’s just no guarantee. I must say I accidentally stumbled upon your site (off Pinterest) and I have been here for HOURS now!! I love Gingers, so after looking at all your work and advice, and then you said ‘Ginger’ I’M SOLD!!! So I have been actually planning on doing my kitchen exactly the same, but opposite. Grey cabinets, white counter tops (quartz) , and after seeing that you went w quartz only for the island, I’ll be looking into that as well. I knew it was an option to use different materials, but I didn’t even know where to start. I was thinking maybe steel wool for the bottom cabinets and grey owl for the top cabinets, is there something I should add to the paint to make it work better in kitchens (grease)? I also have stainless steel appliances, so I also don’t know if I should be keeping the walls white including the back splash. I will be looking forward to receiving your subscription and ‘hiring you’ for my exterior paint selections as well as a cpl rooms. Thank You and keep up the great creativity. Now I refer most in-depth things to Online Consults, but let me give you a heads up…don’t do Steel Wool and Gray Owl together. Steel Wool is amazing (I live with it in our home) as is Gray Owl, but Steel Wool is a gray with a decent cool purple/blue look to it. Gray Owl is a gray that has a green undertone that CAN flex a bit blue. There’s a huge risk that the undertones could totally clash. One of the most SAFE grays for cabinets is BM Amherst Charcoal. 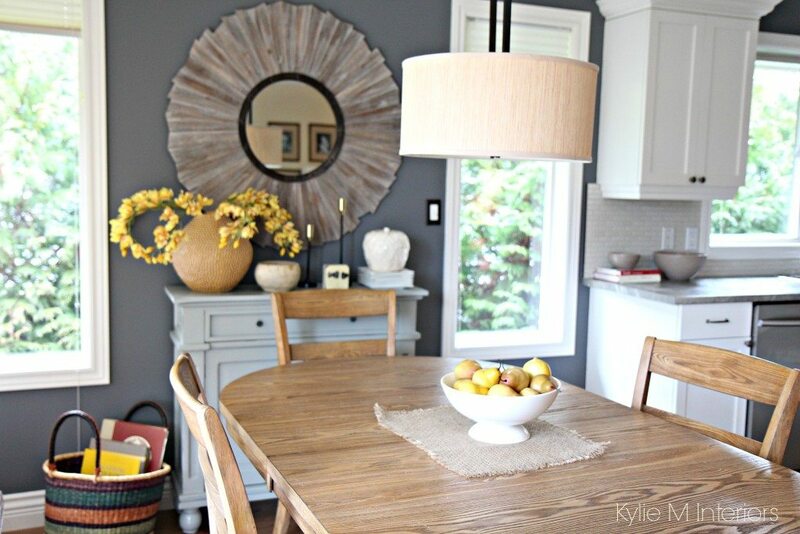 While all grays have undertones, this one is pretty safe and ‘neutral’ and easy to work with. As for the paint, it’s ALL IN THE PREP! Make sure to sand, and use a good primer. From there, I always like Benjamin Moore Advance Pearl finish, it has held up SOOOO well on our kitchen cabinets – I’m 100% happy! I hope that gets you off on the right foot Michelle, chat soon and Happy New Years! I absolutely love that mirror! Can you tell me where you purchased it? Beautiful job on your kitchen. I painted my cabinets BM DEEP IN THOUGHT and it came out lovely. Thank you for sharing this remake! Hi Christine, thank you! I know, it’s pretty wicked. It was actually from Home Sense, so of course it’s a total free for all as to where it came from! And you should send me photos – I’d LOVE to see it!! 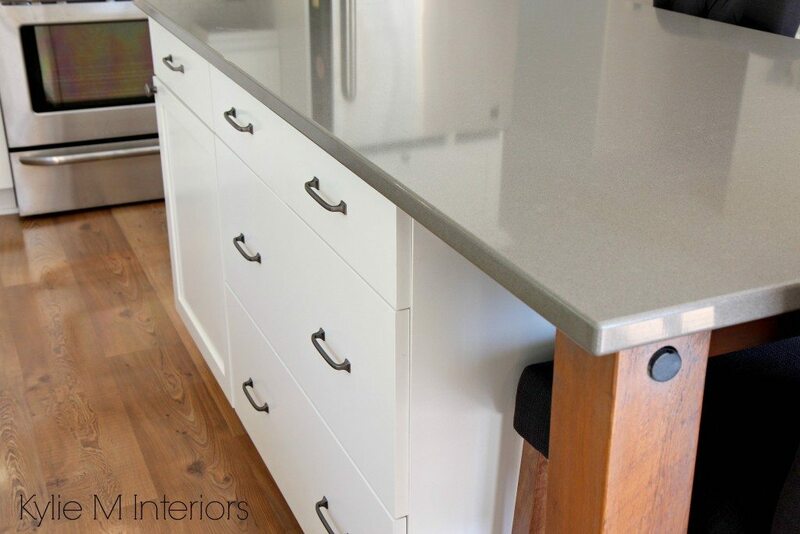 What type of edge for the Formica counter did you use? I want to get quartz but I feel Formica might better fit my budget and needs. Thanks! Hi Lauren! I usually go for the square wrap profile, so that there aren’t any seams, but it ALSO isn’t rounded (which is super dated). Plus, it’s one of the free edges, so no upgrade charge! I love your new kitchen! Instead of Formica, I would like to use granite on my countertops. Which granite would be most similar to the Formica you selected? Thanks! I love your work !,,,,.just a question …is the tile on your backsplash spot on with the cloud white painted cabinets. We moved to our new house and the backsplash is driving me nuts. (I don’t like it, too much going on in my view got blues greys and many more colours on the 1 by 2 tiles ) So when I saw your hexagon tiles it inspired me to ..maybe paint the existing 1 by 2 stone to Simply White ..I’ve painted the trim Simply White but the cabinets are from Ikea so they are more of the Benjamin Moore’s Paper Mache. OC25, which isn’t as nice as simply white) . 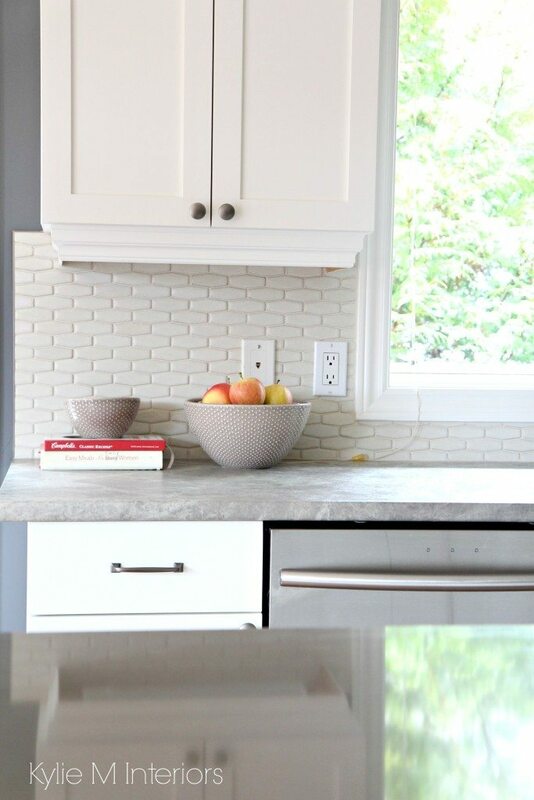 Just curious if your whites are the same…..the counter is dark greyish with flecks in it and your photos really got me thinking maybe I can get a similar looking effect as your kitchen. Until I can change it to a subway tile… we moved in Nov 1st and the walls were painted a funny blue colour so I painted them Kendal Charcoal to get me through Christmas and then two days later I painted the kitchen Grey Owl instead to blend things better. Do you think I’m crazy lol. P.s. I worked at Benjamin Moore and I love the Advance Paint. You’re cabinets look amazing! I was wondering how well the finish is holding up and if you are experiencing any chipping? I also have maple cabinets in my kitchen, and I desperately want a white kitchen but I can’t seem to work up the courage to paint them. They are brand new cabinets, only a year old, that were installed by my home’s previous owners as they were trying to sell the house (which obviously worked because we jumped so fast on a house with a brand spanking new kitchen). I’m terrified of ruining them, or that they’ll look beautiful at first only to be a disaster after a year or two. Unfortunately, replacing them will probably never be in the budget. They really are nice cabinets, I just don’t like the wood color. Would I be out of my mind to paint them? My family thinks I’m insane for even considering doing this to brand new cabinets! I got to your post because I’m looking for durability in a bathroom vanity..I got great advice, which, thank you so much, I wil heed. Anyway, I just had to comment on the kitchen makeover.. By removing the small splash edge on your backsplash, it looks like you gained a foot in cabinet height..Is seems to add such a more open roomier space! I really like the makover.. so modern and updated. What gloss finish did you use on these cabinets? Satin or semi-gloss? We are moving into a house with a NW facing kitchen (as best I can tell) and are having the cabinets painted white (professionally). I am considering a pure white, something like Behr Ultra Pure, with no undertones, but am unsure about the gloss. I am leaning toward a satin since I am going for such a pure white. Thank you so much for the information. I have refinished cabinets in my current home with the Rustoleum kit product and ended up using a satin top coat. I felt like that was probably enough shine too but your confirmation helps seal the decision for this next project. By the way, loving your site. I am finding it so helpful as I plan a total interior paint job on a new home in another state (yikes!). Your LRV post has been incredibly helpful! I am planning a kitchen makeover and your kitchen layout is very similar to mine. I love all your ideas! I want grey walls and white cabinets too. I love the Steel Wool but am wondering if you can suggest a lighter grey that would not clash for my hallway? I am afraid the Steel Wool will be too dark there. Also, I have Cloud White for cabinets and trim right now and would like a bit of a change. Do you think Simply White would work with Steel Wool? I absolutely love that backslash! what is the material and can you tell me where you purchased it? Hi Korey, thank you! That’s a porcelain tile and it was from Home Depot – although I don’t know if they have it anymore! Hi Rachel, that was BM Steel Wool. It’s a gray with a decent blue-purple undertone – if you look at a few other posts, you’ll see it in my entryway as well! OOPS! After I posted my question to you I finally looked up the color of my new cabinets on the maker’s website. I’ve been calling them “honey oak” BUT they’re actually Quartersawn White Oak. My question is still…could they work with Soapstone Sequoia countertops? Hi Paula, I’m a HUGE fan of Quartersawn White Oak and they can work with Soapstone Sequoia for a soft approach. Just get a big sample of the countertop as my ONLY hesitation is that the greige/taupe of the countertop could make your cabinets look a bit MORE yellow (depending on how they’ve aged/stain/etc…) Overall though, no big red flags! Hello, Kylie. Love your site and your work. I was wondering how your Laminate countertop is working out, e.g.durability, staining, etc. Would you do it again? Thanks much. Hi Ellen, it held up SUPER well. Like any laminate, I didn’t put a hot pot directly on it once it had been on the stove. I didn’t have ANY staining problems or areas where the finish was wearing off. I did choose a durable finish (honed), but I would imagine that after many years it could wear in areas that were consistently rubbed at. Short of being quartz/granite (which you pay 3-4X for) I’m super happy with the way it holds up! MOney well spent! Kylie, your blog is AWESOME! Wondering what type of flooring is in this kitchen. The whole kitchen is beautiful. Thanks for your answer in advance. Hi Betty, thank you! Well, it was a few years ago, but I do remember that it was a laminate flooring from Lowes that was the Mowahk brand! Hi! I totally decided to get the Laminate Counter tops in the Soapstone Sequoia thanks to your help! I’m painting my cabinets White Dove and I am pondering my wall color. I love your site!